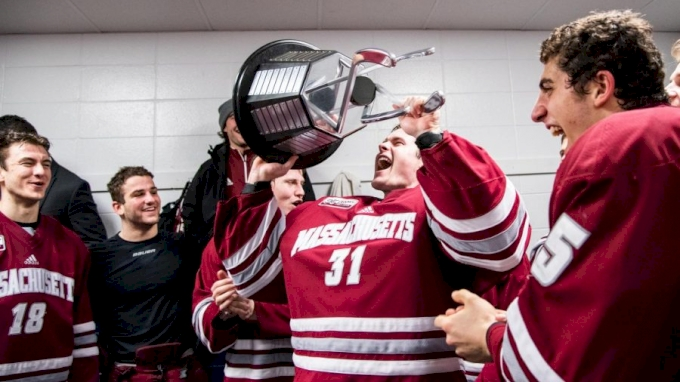 Last week, FloHockey announced a new partnership with NCAA men’s Division I conference Hockey East, expanding its streaming services by 11 new programs and offering a history of championships and budding NHL stars. With esteemed historic programs including current No. 1-ranked Massachusetts, No. 8 Northeastern and No. 11 Providence, Hockey East brings along some of the biggest names in NCAA hockey. Dating back to the 1947-48 inaugural season, the current Hockey East conference has combined for 13 total championships. Boston College and Boston University lead the way with five championships apiece. Maine has won two and Providence one. The Hockey East conference has also combined for nine Hobey Baker Awards since the inception of the award in 1981, including three of the past five winners. Hockey East has been a significant supply chain for NHL talent in recent years as the collegiate path grows. At the start of the 2018-19 NHL season, a total of 64 Hockey East alumni—35 forwards, 20 defensemen and nine goalies—earned a roster spot out of camp. When you include those currently in the American Hockey League, the number grows significantly. Twenty-six of 31 NHL teams started the season with at least one former member of Hockey East on their roster, led by the Pittsburgh Penguins with six. The Carolina Hurricanes, Montreal Canadiens, New York Islanders, St. Louis Blues and Tampa Bay Lightning were the only teams without a single Hockey East alumni. The conference has developed a number of notable NHL players and coaches, including current head coaches David Quinn, John Tortorella, Jim Montgomery, John Hynes, Mike Sullivan and interim coach Scott Gordon. Keep reading to learn more about some of the current NHL players who spent their college years competing in Hockey East. Known as Johnny Hockey, Gaudreau spent three years tearing up the scoresheet for Boston College, where he earned Hockey East Player of the Year honors twice, won the 2012 NCAA Championship, Beanpot and Hockey East Championship and was named MVP of the latter two. Gaudreau capped his college career with an NCAA-leading 36 goals, 44 assists and 80 points in 40 games in 2012-13. He made an immediate impact at the NHL level, where he currently holds 124 goals and 233 assists for 357 points in 359 games. The 25-year-old is second in the NHL with 69 points (27 G, 42 A) through 47 games this season for the surging Flames. Eichel was the second freshmen in NCAA history to earn the Hobey Baker Award and was simultaneously named the NCAA Rookie of the Year when he recorded a league-leading 26 goals, 45 assists, 71 points and plus-51 rating in 40 games during the 2014-15 season. He was drafted behind Connor McDavid in 2015 and has faced his share of criticism during his four-year career, but he’s largely let his offensive play do the talking. The 22-year-old owns 88 goals and 138 assists for 226 points in 252 NHL games. Eichel was named captain of the Sabres prior to the 2018-19 season, where he’s 20th in points per game with 15 goals and 49 points in 43 games played. Quick shattered UMass Amherst goaltending records when he carried the Minutemen to their first-ever NCAA Tournament bid in 2007 on the heels of a 1912-5 record backed by three shutouts, a .929 SV% and 2.16 GAA. Quick went on to backstop the Kings to a pair of Stanley Cups in 2012 and 2014. The former Conn Smythe winner has been a top 10 Vezina Trophy finalist six times. He owns a 301-206-58 record with a 2.30 GAA, .917 SV% and 51 shutouts in 577 NHL appearances. The 2018-19 season has been an outlier for the 32-year-old as the Kings have struggled and sit near the bottom of the league. But Quick still has a lot of great hockey left, as does the Kings’ core, while they trend toward youth and speed. Other notable Hockey East alums: Cam Atkinson, Jimmy Howard, Ben Bishop and James van Riemsdyk. Don’t miss out on your chance to stream all Hockey East games come playoffs, right here on FloHockey. The conference joins the Big Ten, WCHA, and more as streaming options provided by FloHockey.